India Web Wide is renowned name in IT industry providing Development, Training and Internship. We are functional since 2007 and provides PHP internship in mohali to aspirants from Btech/BCA/MCA & working professionals. We have well experienced and proficient trainers of PHP, who can deliver high quality lectures on upgraded versions of PHP. They are having years of experience in corporate sector and develop software for both domestic and international clients. Our training Company in mohali has sophisticate established labs equipped with all amenities, essential software installed and excellent infrastructure. We have trained 5000+ students till now and help them in getting placed in CMM level companies. Our php training course fee gives complete justification to your money being paid, we also have a provision of customizable course content that can be tailored according to the need of each student’s training requirements. We have a Decent placement record , our students been placed in many top notch IT firms and progressive startup companies. The training fee we charge is affordable for students and a complete worth to your money being paid. 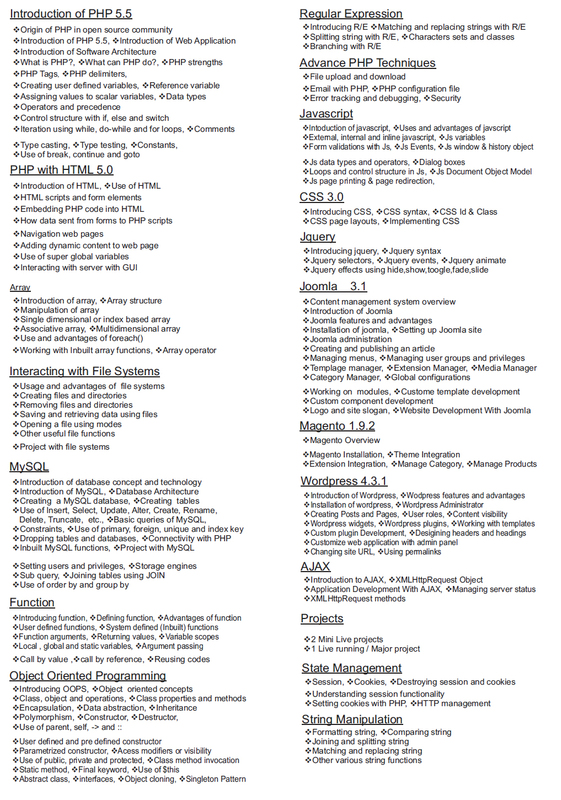 India Web Wide has a dynamic course content approach, i.e. course curriculum’s are changing periodically according to the growing need of IT sector. We provide training in diffrent latest technologies like ASP.Net 4.5, Java/J2ee, PHP 5.5, SEO, Networking A+, Software Testing, Android application. 100% job assistance though IWW will assist the candidates to get placement in the well reputed firm in different locations. "I found the training methodology is good and unique. This php training is different from other such training's because it gives practical exposure to PHP concepts. I would like to recommend this training to students because I got placed in a reputed company after completing this training at a respectable position and learning new PHP concepts everyday. I feel confident that I can handle the role of a web developer coder given an opportunity"
"The trainer was very patient and the use of examples during training made it quite lucid. The staggered training schedule gave ample time to understand the lessons." "The training sessions were interactive and the use of live examples helped a lot. The environment was dynamic enough to create an on the job feel. " "It was a wonderful experience being a part of this IWW. I am taking with me a lifetime of learning about PHP & MySql. I have learn to create dynamic websites using frameworks like MVC. The ease, the comfort and depth of knowledge I got from IWW. IWW is a leading web designing company that develops & designs best websites using Bootstrap, PHP etc. Thanks to IWW for guiding light to my path of life."